TimberWest Magazine November/December 2011 - Quartz Logging Inc.
Pictured is Donally’s 1,200 ranch. 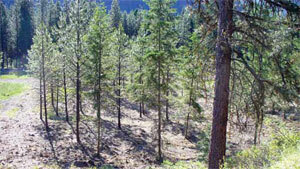 Fire reduction projects are financed in part by Montana Dept. of Natural Resources’ “Jump Start” program funded with federal stimulus money. The goal is to reduce fuel loading to minimize fire danger. In addition to slumping lumber markets and high fuel, insurance, and maintenance costs, western Montana loggers like Donally, headquartered near Superior Mont., are reeling from the permanent closure of Stone Container pulp mill in Missoula — a 2010 event that left 500 workers unemployed and drastically diminished local pulp markets. Pulp log transportation costs are cutting deep into already slim profits. Donally has also noticed shifts in regional timber bidding and purchasing. Traditionally, local mills have secured 80 percent of timber sale bids and loggers 20 percent. Mills purchasing stumpage would contract loggers and provide them work. “In 2010 though,” Donally says, “loggers were winning 80 percent of the bids in an effort to keep their men and machines working.” The trend “to buy work,” and sometimes bidding too much for the timber, is resulting in the financial failure of some area loggers. At the same time, outfits like Quartz logging, who are not bidding on timber sales, simply have fewer logging jobs available. Despite being faced with these incredible challenges, Donally is still finding ways to maintain an adequate profit margin so he can continue logging. 1998 Daewoo 220LL — owned and operated by Rick Lewis of R&E Logging — processes, sorts and decks stems as well as piles slash and brush at the landing. Donally says that survival in today’s timber industry requires close scrutiny of the cost of doing business and accurate assessment of profit margins. While he has always been attentive to counting the costs, he now considers it more important than ever — especially when it comes to equipment. Quartz Logging began in 2002 when Kevin Donally decided leasing a Timbco 425B to fell timber for an established logging contractor would be a profitable move, especially after several years working off and on in the industry. Kevin Donally says knowing the precise cost of doing business enables him to determine which jobs will actually be profitable. He sees no value in fielding his current machine, a Timbco 445D, if the work only pays the bills and racks up hours on his machine. 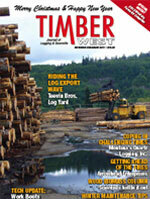 Using a Timbco 455D, operator Mike Wheeler fells saw logs and pulp stems. They are bunched along with small stems and brush to reduce understory. For nearly a decade, Quartz Logging has primarily subcontracted timber felling for commercial harvests. Current market downturns, and the resultant decline in traditionally available work, have caused Donally to consider other options, including government funded fuels reduction and stewardship programs. For example, Donally recently completed a project to reduce fuels on 176 acres of timberland on his own 1200-acre ranch adjacent to Interstate 90. Felling and “snipping brush” down to one inch in diameter or less, is accomplished with Quartz’s Timbco. It is time consuming to carefully maneuver between “leave trees” to produce relatively small volumes of merchantable stems, so Donally runs the machine two shifts, hiring a second operator for the second shift. 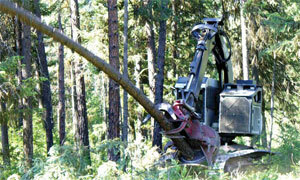 Turns of full-length trees and brush are yarded to a landing with a grapple skidder where they are separated and processed by a stroke delimber. Saw logs and pulp are shipped to mills, and brush is piled for burning. By tapping into fire reduction funds, Quartz logging is able to keep working when other profitable work is scarce. John Deere 648E grapple skidder is owned by Doug Hall and operated by Marty Rich. Turns are pulled to landing where they are processed and sorted and slash is stacked. Although competition typically becomes more intense when tough economic times arise, Quartz Logging prefers fostering a spirit of cooperation to everyone’s benefit. “There is less work and money available, but everyone still needs to get some,” says Donnally. As a timber felling sub-contractor, Kevin works closely with general logging contractors like Doug Hall, owner of Hall Wood Processing of Potomac, Mont. Doug and Kevin collaborate to prepare bids that will be both profitable and competitive work for both companies. Donally owns a lowboy trailer, and Doug Hall owns the truck. Together they are able to move their own equipment as well as contract transport for others. Similarly, when equipment and resources are needed to complete a project, Quartz logging evaluates options for efficient completion, which often means providing some work for others. On the Donally Ranch fuel reduction project, in addition to the 2nd shift Timbco operator, Kevin hired a John Deere 648E grapple skidder and operator from Don Hall. 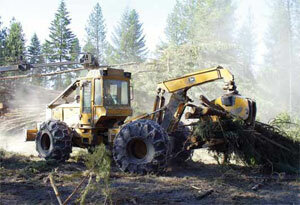 Rick Lewis of R & E Logging subcontracted the processing with a Daewoo 220LL stroke delimber. By cooperating with other contractors and spreading the work around, Quartz logging is doing its part to sustain the shrinking logging industry infrastructure vital to future industry viability. For most loggers, purchasing new equipment is always a consideration, and Donally is no exception. Given the state of the industry though, he has opted to refurbish pumps, motors, hoses, and air conditioning on his current unit until improved cash flow allows substantial purchases. Although the timber industry continues to be in a slump, and western Montana loggers, in particular, are facing significant challenges, companies like Quartz Logging are managing by being careful and conservative in their financial practices, while fostering a spirit of cooperation. They are optimistic that this will benefit the entire industry well into the future.